I don't remember making any of Guy Fieri's recipes before but this is one I will definitely remember. 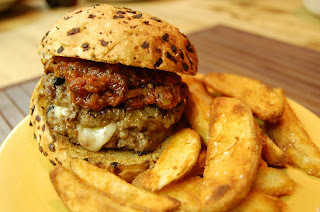 Think delicious burger with melted cheese and spicy Chorizo sausage inside, topped with a spicy homemade ketchup. Yum! I thought Guy's Killer Inside Out Burger sounded great so I wasn't really surprised about how it tasted. What amazed me is how simple the burgers were to put together. Definitely a hit. My nephew was visiting from college and he gave it a thumbs up too. This will be my contribution to the Food Network Chefs Cooking Challenge this week. Haven't heard of it? A great group of people have decided to cook their way through the roster of Food Network chefs. This week was Guy Fieri. Next week is Ina Garten. They pick the chef. You pick the recipe. How fun! Head on over here to see what everyone else fixed. In a medium pan over medium to high heat, add bacon and onions, cook until the bacon is rendered but not crisp. Add the chorizo and cook until done. Remove the bacon mixture to a paper towel-lined plate to drain and cool. Divide ground chuck into 8 equal parts. Form into a loose ball, and create 4-inch patties. Layer 1 piece of cheese onto the center of 1 patty. Top with 1/4 bacon mixture, another slice of cheese, then add another patty on top and gently seal edges and form into a patty, about 4 inches wide and 1 1/2 inches high. Repeat with the remaining patties to make a total of 4 large patties. Heat a medium saute pan over medium heat. Place all 4 patties in the pan and cook for 3 to 4 minutes on 1 side, then gently turn over and cook for another 3 to 4 minutes. Remove the pan from the heat, cover and pop it in a 250 degree F oven for 10 minutes. Remove from oven, place onto rolls and serve with Worcestershire Tomato Ketchup. I love your blog! It is awesome- I am glad I found it! Everything looks amazing and I can't wait to try some of these recipes too! I am a mother and finding meals that are great for my son BONUS! Thanks! Oh, and I am also a runner! Bacon, swiss cheese, chorizo, beef, oh yes, I'll have one. they sound indulgently wonderful! I loves me some Guy Fieri and some chorizo ... winning combination here, I'd say! Yum! These look amazing! CHirizo in a burger - yum! I've only made inside out burgers once and they didn't cook really well. These may get me to try them again :) Thanks for participating in FNCCC....sorry I'm commenting so far after the fact - computer problems.